It’s been a few weeks since TNNA, and the book is still in progress. On target? I’m not sure. In any case, it’ll be out before the big October events. While I’m waiting for word from my publisher, I’m also working on some new patterns. I mentioned earlier that I had approached Artyarns with interest in submitting a pattern for one of their upcoming one-skein pattern books, this one specifically on hats. Iris was immediately enthusiastic about a submission from me — I have had in mind a concept for a double-knit lace hat, and since Artyarns is often associated with gorgeous lace patterns (but Iris clearly aspires to have more reversible patterns in her yarns), I thought it would be ideal to try one of her yarns for this project. I chose Ensemble — a luxurious silk-cashmere “blend” (really just a strand of each held together) because I wanted something without so much “aura” and I wasn’t sure I could get a full hat out of a skein of Ultramerino 4. The latter yarn will be great for more traditional double-knit patterns, but the Ensemble lends itself well to the sort of work I wanted to submit. While at TNNA, I selected a couple of skeins of each, deciding to try the Ensemble first and if it didn’t work out, try the Ultramerino afterward. But that wasn’t the end of it! 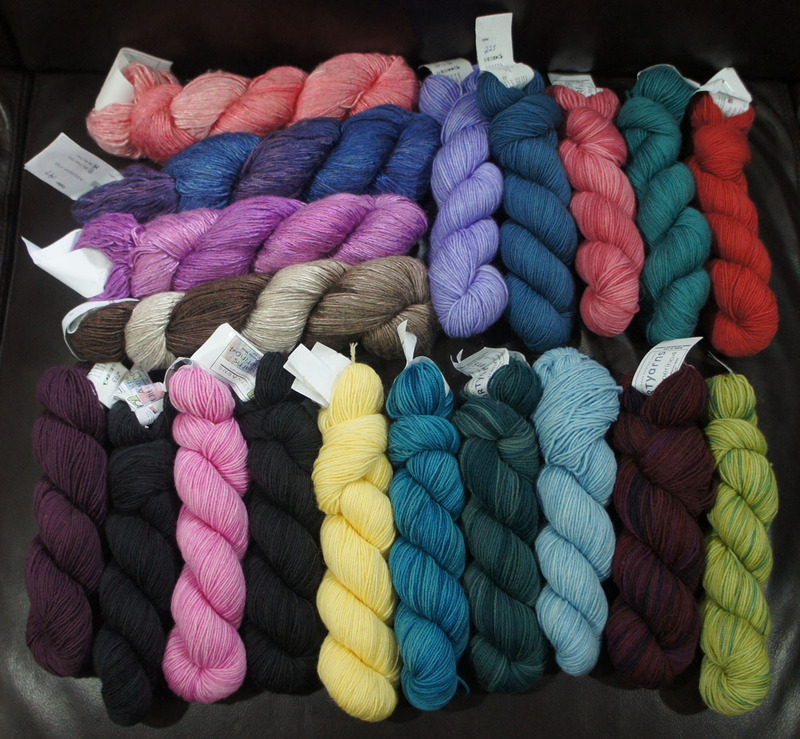 Iris emailed me about a week after TNNA and told me she’d sent me some other yarn to play with, and get inspired by. A little while later, I got this in the mail. The 4 horizontal ones are Ensemble, and the rest are Ultramerino 4. Iris, I am so grateful that you’re so enthusiastic about my work, and thankful that you value my artistic integrity enough to give me free rein with so much lovely fiber — and I am so looking forward to incorporating more of your yarn into my future designs. The selection you sent me is gorgeous, and I’m already having so much fun with the ensemble of Ensemble I got at TNNA. It’s wonderful stuff, and unexpectedly extremely durable in addition to being softer than anything I’ve ever designed with before. I don’t have a photo of the piece I’m working on yet — actually, I had to rip it out last night (next time: lifelines! but here’s an unexpected bonus — the yarn doesn’t “kink” after being ripped out!) but I’m really happy with the way it’s coming out and I’ll be posting it up here once I’ve gotten far enough to show off the pattern well. ← Help me get doubleknitting.com!